Probably a hand-me-down from the discontinued Croce D'Aune group of 1991. Often confused with the D'Aune for this reason, as well as the Athena crank of the late 80's and early 90's (Athena does not have the integrated crank bolts). Oddly enough, the Athena crank inherited what appears to be the previous generation Chorus crank in 92, further confusing the mix. 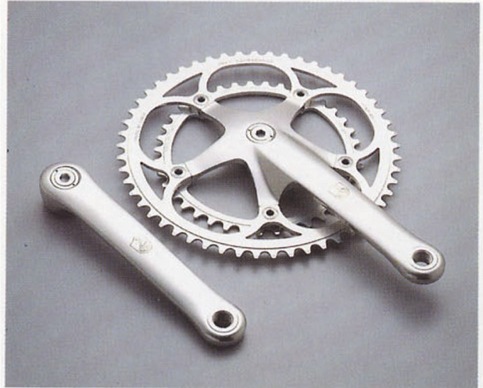 This version of the Chorus crankset did include an incorporated extractor as seen in the photos. Details: Second generation C-Record era Chorus (aka Chorus RS), was released in 1991 with cranks from the first generation Croce D'Aune group and Record brake pads and holders for the Second generation Monoplaner brakes.